I am an ambassador for Best Damn Race. I receive some race rewards in exchange for my promotion of the race series. All options are my own. Last Saturday was my first official race of 2017. I confess, it was time, and the 10K at Best Damn Race Jacksonville seemed like a great way to kick off the year. I wasn’t able to make it to the race expo on Friday, so I left a little earlier Saturday morning to make sure I had enough time to get my packet. It rained for most of the drive, and I was pretty aggravated by that. Rain is no weather condition for race day. Despite the construction at EverBank Field, parking was no issue, and I was able to walk right over to Memorial Park (with a pit stop at the rest room, of course). Packet pickup went smoothly and I headed over to the BDR tent to meet up with some of my fellow ambassadors. The morning remained pretty foggy and misty, while we waited for our 7:00 AM start time. My plan was to run with Steph, so she came over to meet up, and then went to get on the bathroom line. The rest of us got to chatting and catching up, and before I knew it, I had a text from Steph saying we needed to get to the start line. And wouldn’t you know, we had about eight minutes to go! I have a lot of pre-race anxieties, and timeliness is high on that list. I often barely sleep the night before a race because I am terrified that I won’t hear my alarm and will miss the start. I’m not really sure how I let things get away from me like that. As we hustled over to the starting corrals, I realized I had to go to the bathroom again. There was a line. And it was 6:55. I hemmed. I hawed. The line seemed to clear, and I decided I just had to go for it. I made it to the start line with less than a minute to spare. Victory was mine. It also means that I don’t have a great photo of the start line, because there just wasn’t time. In the rush, two things happened: I hadn’t been able to reconnect with Steph and I had left my sunglasses in my bag at the booth. 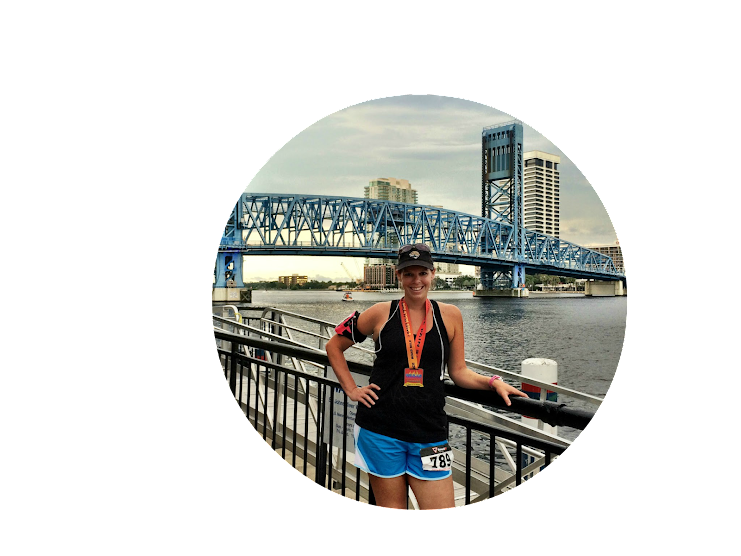 Both were pretty upsetting – even when it’s not sunny, my eyes are really sensitive to the glare (I ALWAYS have my sunglasses) and I wasn’t really mentally prepared to run 6.2 miles on my own. The show must go on though, so I plugged in my music and merged into the moving runners. My good luck from the bathroom carried over – the day never brightened thanks to the thick fog AND within the first quarter mile, I found Steph on the course, and we linked up! All good things! 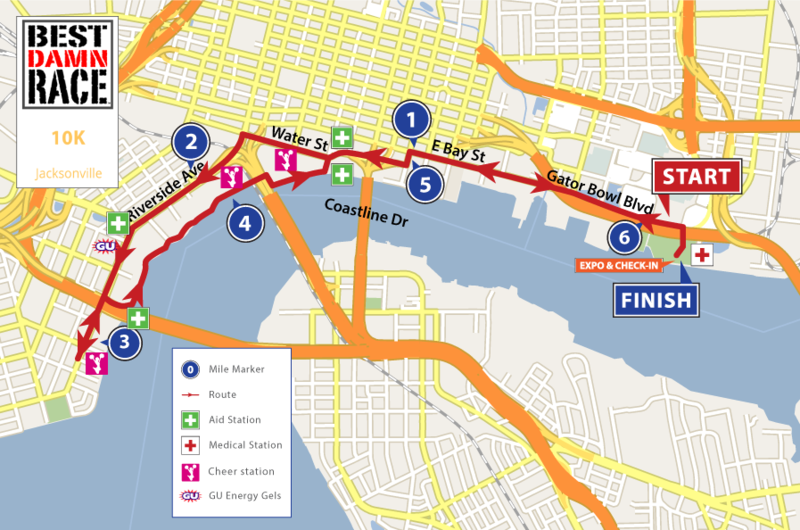 The 10K course is fairly straightforward – the challenge comes with a big incline up the Acosta Bridge, some little rolling ups and downs on Riverside Avenue, and then the pedestrian bridge back over the river. Nothing significant, but a nice bit of variety for a flat city. It was a nice run. Steph was also just getting back into things, and so I wanted to keep us consistent. We met that goal, and had a lot of fun doing it. When you get to talking, it makes the miles fly by. Water and Nuun were plentiful, with four aid stations on the course, and there was ones station offering Gu. I didn’t need to take advantage of any of that this year, but it was nice to have available, just in case. We collected our bling, and collected our spoils: the medal, beer, and pizza, fruit and diet coke from the food tent. Yum. Best Damn Race offers a full complement of beverages and snacks. I am good with a cold beer after a run, but offerings included Best Damn Root Beer and Best Damn Cherry Cola, a variety of mixed drinks, water, Coke, Diet Coke and Sprite. I love that they had pizza, bananas, orange slices, brownies, chips and granola bars, too. A little something for everyone. There is this one. Which, of course, is kind of funny because I remember being a lot less angry at the finish line. Smiles. In sync. Feet off the ground. I spent the rest of the morning with the ambassadors, who were either helping out at the race or running different distances. And then we called it a day. I love this race and can’t wait for March, when I can do it all over in Orlando. This time, I will be taking on the 10K + 5K Challenge with Meghan. But we will also score this! I cannot wait! 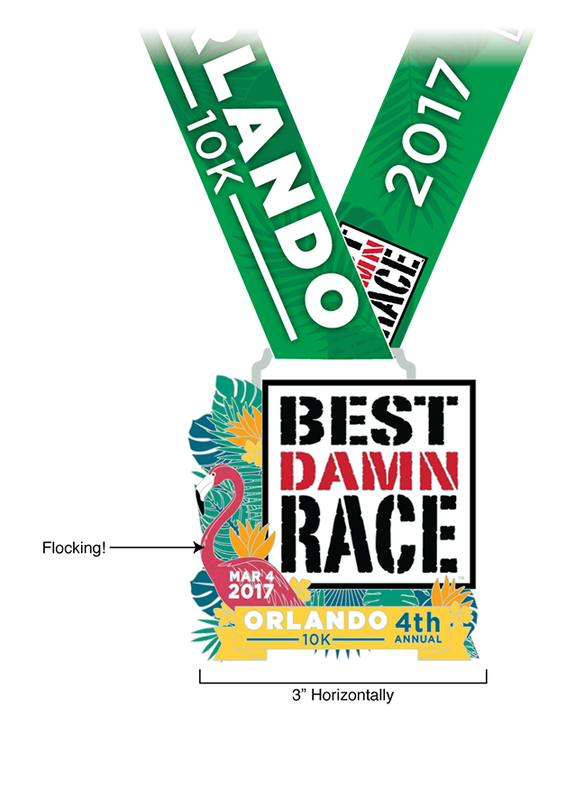 Don’t forget, if you want to join us for Best Damn Race Orlando, you can still save $5 on your registration for any distance with code RUNPUGS! What makes a race “the best” for you? What’s your favorite post-race refreshment? Sounds like a good race. That medal is awesome! Sounds like a great race. I want to do a BDR someday. Love the smiling group pic!! 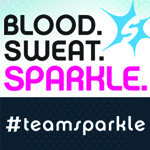 This does sound like a very awesome race – free Nuun and race pics are such great little perks! Great recap! This race sounds like fun. Yay for a series too and opportunity for more bling too! After a hot race I enjoy a popsicle or watermelon. These races look like so much fun! I love the shirt and the bling! Congrats! I love the Best Damn Race and can’t wait for New Orleans! Great bling, great time and drinks! Nice review! That license plate BLING rocks! What a great addition to your medal rack and I’d totally be sportin that shirt around! Great job at the race. Sorry to hear about the stressful start to the race. Its always difficult to put your best forth forward when you’re stressed at the start line. You’ll have a better race next time. Congrats on your race! It looks like it was a really fun time and free race photos are always a plus! Glad it all worked out in the end! Congrats on a great race!! Very nice photos, too! I love the post race party that BDR has. I am not a beer drinker, and it is hard to find places that offer pop as well as beer and water. I didn’t see the Root Beer or Cherry Soda. I grabbed a Coke and made a beeline for that pizza. I was hungry! Looks like a great race, I need to def check it out, I just missed the one near me. Great job! 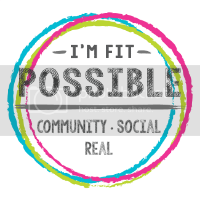 It’s always great to get awesome race photos and free ones at that! Congrats on your race even though it was not a PR. 10K is such a fun distance! Love the bling for that race. Such great medals and fun t-shirts too! 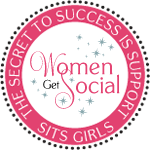 Sandra Laflamme recently posted…When good isn’t good enough. Sounds like such a fun day! I think you’re just as successful if you finish a race feeling good and happy as you are when you hit a PR. Nice work! You are an ambassador for the coolest races! I have been considering both the Savannah one and the Best Damn Race Orlando one but want to wait and see how Florida Half Marathon next weekend goes because I had to cut down on running in January b/c of a slight injury. I noticed the 10k/ 5k challenge is more expensive than the half, LOL! Oh, no! I hope you are feeling better soon! Three medals for the challenge, though! I hope you can make it to both! 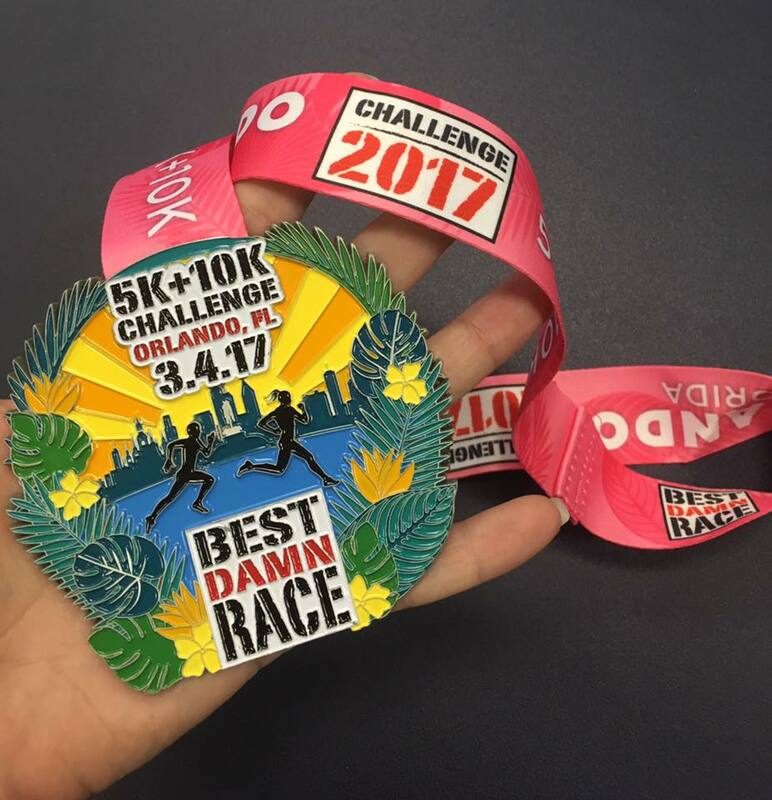 Best of luck at the Florida Half!